Editor's note: This article is taken from a longer piece that looks at experiential learning programs under the University of California's Global Food Initiative. As a freshman at UC Santa Cruz, David Robles felt frustrated. He was learning about environmental problems in his classes but couldn’t see how he could help solve them. Then, against the odds, he was one of only two people selected among 200 applicants for a work-study job on the campus farm. Suddenly, a career path took shape. 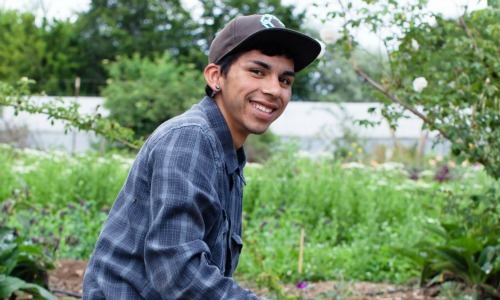 Now a senior, Robles has spent three years as an assistant farm and garden manager in preparation for what he hopes will be a career in social justice centered around agriculture. But before he graduates, he is undertaking a fitting final project: Coordinating, producing and writing lyrics for a rap music video that highlights experiential learning in food and agriculture as part of his UC Global Food Initiative Student Fellowship. From well-established student farms at UC Santa Cruz and UC Davis to a crop of new gardens, courses and programs popping up across the University of California system, UC is offering experiential learning opportunities to students at all levels. This hands-on learning offers invaluable real-world experience to students, diversifying their skills, providing leadership development and helping prepare them for successful careers. Overall, UC offers more than 200 courses and 150 programs related to experiential learning in food and sustainable agriculture systems. For example, farms and gardens provide diverse opportunities for students to participate in activities related to food, nutrition, research, education and outreach, according to a new Global Food Initiative report that highlights best practices, lessons learned and case studies of experiential learning across the UC system. At UC Santa Cruz, new undergraduate internships give students from across the campus a chance to work alongside participants in the Apprenticeship in Ecological Horticulture, the six-month, full-time residential training program in organic farming and gardening offered by the UC Santa Cruz Center for Agroecology and Sustainable Food Systems. In all, about 200 undergraduates a year participate in the Center for Agroecology and Sustainable Food Systems’ fieldwork-intensive classes and internship programming. In addition, some 3,600 pre-K-12 students visit the UC Santa Cruz Farm annually for environmental education through Life Lab. UC Santa Cruz also partners with FoodWhat, a youth empowerment and food justice organization that works with low-income high school students in Santa Cruz County. In July, a three-day national conference will be held at UC Santa Cruz in collaboration with the Sustainable Agriculture Education Association. The conference will be a chance to discuss sustainable agriculture education and see examples of experiential learning in action. Parr hopes to debut Robles’ video at the conference. Robles noted that his video is about experiential learning and is a form of experiential learning – bringing together diverse groups from film students to music students to sustainability students. “I hope to inspire more students to join those organizations and find themselves like how I found myself on the farm,” Robles said. The Global Food Initiative’s Experiential Learning subcommittee has produced a directory of UC experiential learning courses and programs that have experiential components in food and agriculture systems; a report with lessons learned, best practices and case studies titled “Learning From the Ground Up”; and released several related student-produced videos. The report’s authors include Kate Kaplan, Jennifer Sowerwine and Ann Thrupp, UC Berkeley; Mark Van Horn, UC Davis; and Damian Parr, UC Santa Cruz.